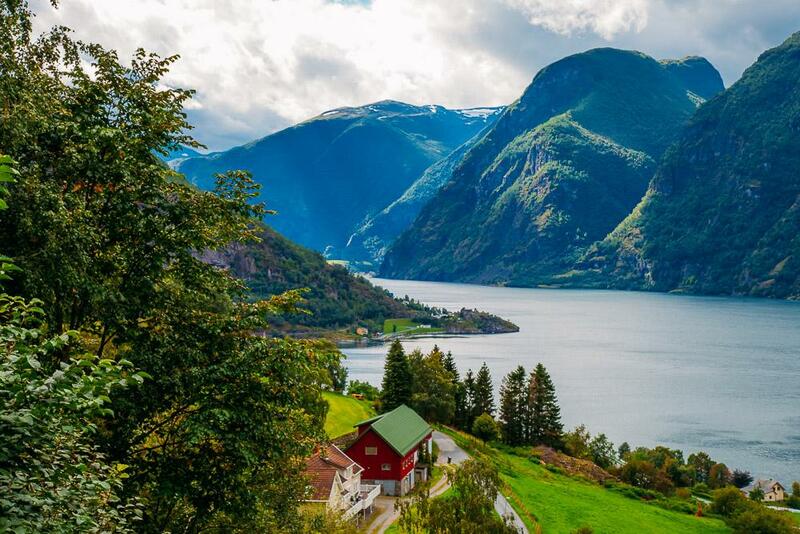 Cutting over 200 kilometers inland, Sognefjord is Norway’s longest fjord and home to some seriously stunning views. And with all the smaller fjords branching off of Sognefjord, there are so many amazing places to stay along Sognefjord that feel like wonderfully tucked away hidden getaways. Because while of course a lot of tourists stay at hotels in the village of Flåm, famous for the Flåm Railway, there are so many other hotels in much more scenic parts of the fjord. At least, I know I like to get away from the tourist crowds a bit while on holiday. 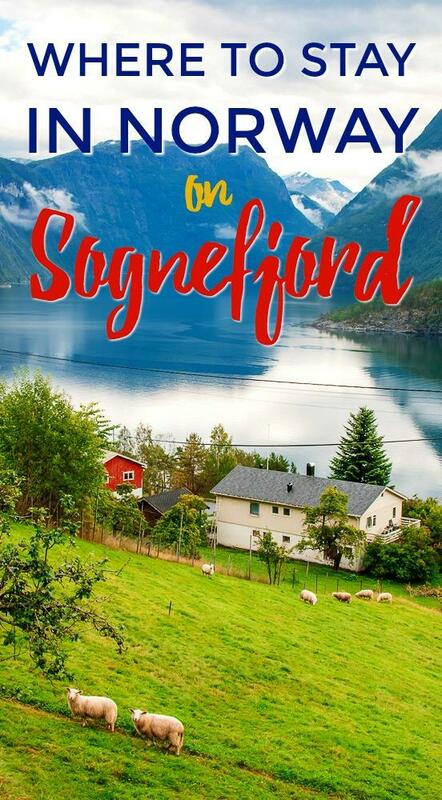 So here’s a guide for where to stay on Sognefjord off the beaten path, including the best hotels, hostels, and other Sognefjord accommodation to stay at while enjoying those fjord views. This old family-run hotel dates back to the 1930s and it just oozes character, while also maintaining an impressive level of luxury. 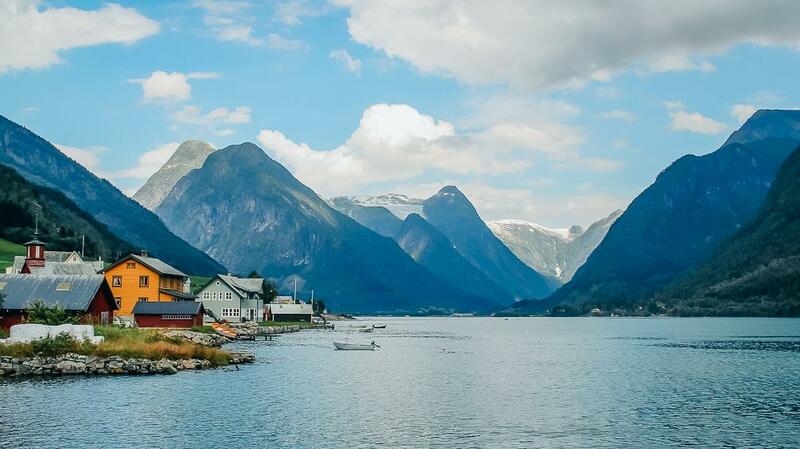 The hotel is right on the fjord, and from the delicious Norwegian meals served in the restaurant to the old antique Norwegian furnishings, staying here is the perfect way to experience Norway. It even has a private beach! While this perhaps might not be ideal for people looking for a modern luxury hotel, if you want to experience more of Norwegian culture the Fjærland Fjordstue Hotel could not be more perfect. This is another lovely place to experience Norwegian culture and history. Set on a working farm, this B&B is rustic, but also super luxurious at the same time. Staying here is an intimate experience, where you’ll get to know the hosts and other guests, and you’ll really feel like you’ve left the tourist path and found a hidden gem here. If you really want to stay in Flåm, this is the nicest hotel in town. I do tend to advise people to stay outside of Flåm, as the prices are much higher here and the hotels book out really quickly, but there is something to be said of the convenience of staying here! 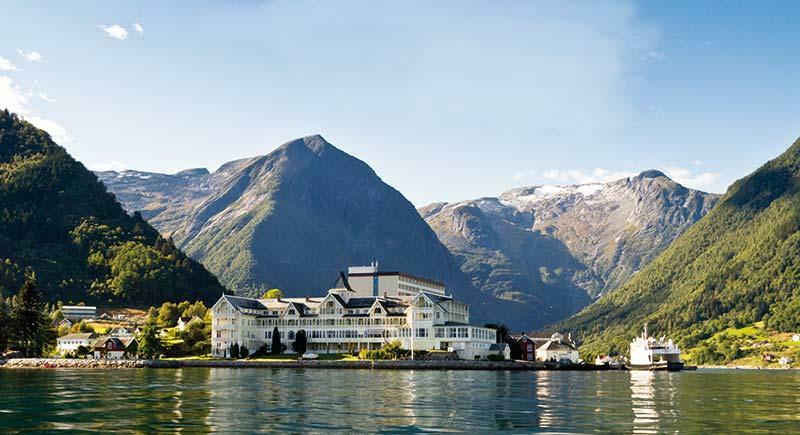 Fretheim Hotel is right next to the Visitor’s Center, and the hotel itself is a beautifully decorated, refurbished 1800s manor house, with luxurious rooms all with mountain or fjord views. The railway station and ferry port are both an easy 5-minute walk from the hotel, so it really is incredibly convenient. 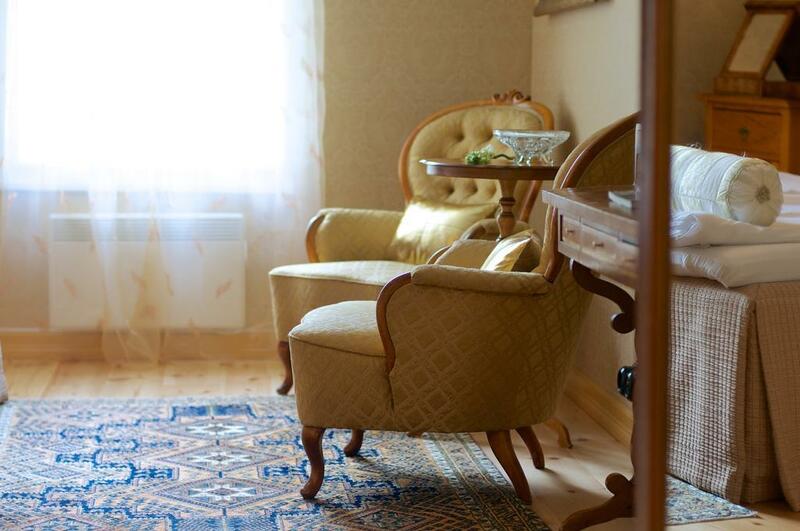 Just be sure to book your stay as soon as possible – Fretheim Hotel usually books up for the summer months in advance. This grand 18th century hotel is right on the water, with both a modern wing and a historic wing filled with art and antiques. The views from here out over Sognefjord are breathtaking and here you’ll enjoy one of your best breakfasts in Norway. The best part of Kviknes Hotel is definitely its stunning location, as well as how conveniently central it is – you’re just a short walk from the beach, shops, and cafés here. 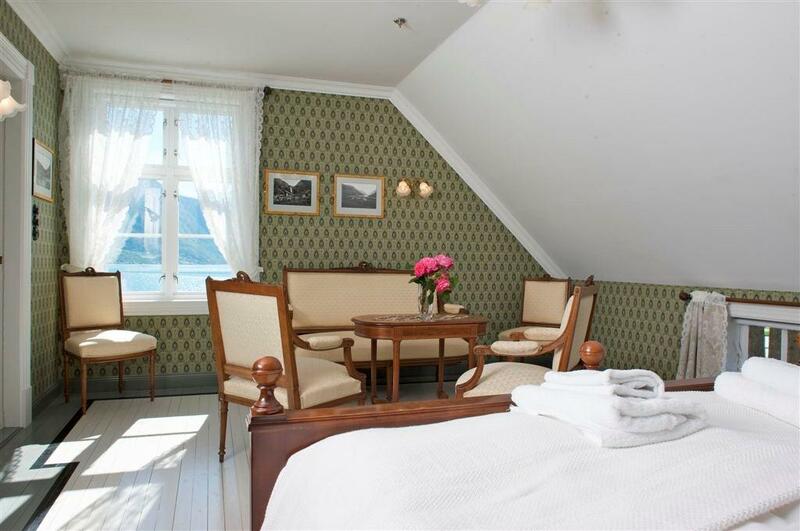 If you’re looking for a boutique hotel with lots of character, Sognefjord has several fantastic options. Personally, this is my favorite accommodation on Sognefjord, as nothing is more idyllic than staying in a beautiful boutique hotel in a small village in a Norwegian fjord. I mean, right? In fact you probably noticed that even my luxury accommodation preferences erred on the boutique side. 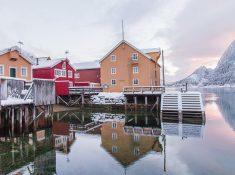 These hotels also are filled with Norwegian character, but are a bit more affordable. While everyone tends to stay in Flåm, there’s a much more beautiful village nearby that is still conveniently nearby the Flåm Railway and ferry port, but quiet and not crowded with other tourists: Aurland. I always recommend Aurland to people asking where to stay on Sognefjord and nearby Flåm. And seriously, the views from Aurland really could not be more breathtaking – it’s pretty amazing that it’s still so quiet and peaceful there! And if you’re looking for a lovely, unique hotel in Aurland, you won’t do better than Vangsgaarden Gjestgiveri. The buildings in the hotel date back to the 1700s, and the inside really does feel like going back in time. Plus it’s right by the beach and has beautiful views out over the fjord. You also have the option to stay in a room at the hotel, or you can choose to stay in one of their little cabins with a fjord view (I’d choose a cabin if I were staying for longer, and the hotel for just a couple of nights). If you stay in one of the cabins you can self-cater, and there’s a supermarket just a few minutes away, or you can eat at the adjacent Duehuset pub. This 9th generation family-run hotel is actually Norway’s oldest hotel, dating all the way back to 1640! The hotel keeps true to its historic roots with antique furniture and old-world decor, while also maintaining modern comforts with luxurious beds and pristine bathrooms. It’s located in the quiet village of Svolvorn, and just a minute walk from the beach. It’s also worth dining in at the Walaker Hotel, as their 4-course Norwegian dinners overlooking Lustrafjord are truly an experience! The hotel is also nearby the 12th century Urnes Stave Church and Jostedalsbreen Glacier. If you’re headed to Bergen, then Lavik can be a really convenient place to stop and spend a few nights on Sognefjord on your way. The Lavik Fjord Hotel is run by a really nice Dutch guy, and the views of the fjord are spectacular (be sure to upgrade to a room with a fjord view!). The traditional Norwegian food served in the dining room is delicious, and the rooms feel very luxurious. There are lots of activities to do to explore the surrounding area, and the staff are more than happy to help give you recommendations. The hotel itself is also just really good value. If you’re looking for a hotel in Balestrand, which has a lot of activities for tourists, like fishing, hiking, and canoeing, then Kringsjå Hotel is my top choice. The rooms are really pretty with nice homey decor, and again, this hotel has amazing views of the fjord! It also has a communal kitchen that you can use to self-cater, which is a huge money saver in Norway, as eating out here is really expensive. Yes, budget accommodation on Sognefjord does exist, and I’m not just talking about camping! Here you can either stay in private rooms with shared bathrooms, or your own little self-catering cabin. There’s a communal kitchen for those staying in the rooms, so you can save money by cooking for yourself (eating out in Norway is super expensive!). The location is beautiful and quiet, and the perfect base for outdoor activities, from the fjord to the glacier. This is also one of the cheapest places to stay on Sognefjord. Again, I don’t tend to recommend that people stay in Flåm as it’s crowded and overpriced, but staying here can be incredibly convenient if you want to be walking distance from the Flåm railway station or ferry port (especially if you don’t have a car). This eco hostel is very clean and bright and run by enthusiastic staff who are happy to advise you about the area. It’s also a great place to meet other travelers. Just be aware that this hostel books up really quickly in the summer – you’ll probably need to make a reservation months in advance! Aurland is my topic pick if you want to be near Flåm, as it’s a small village near Flåm but much quieter and more reasonably priced. 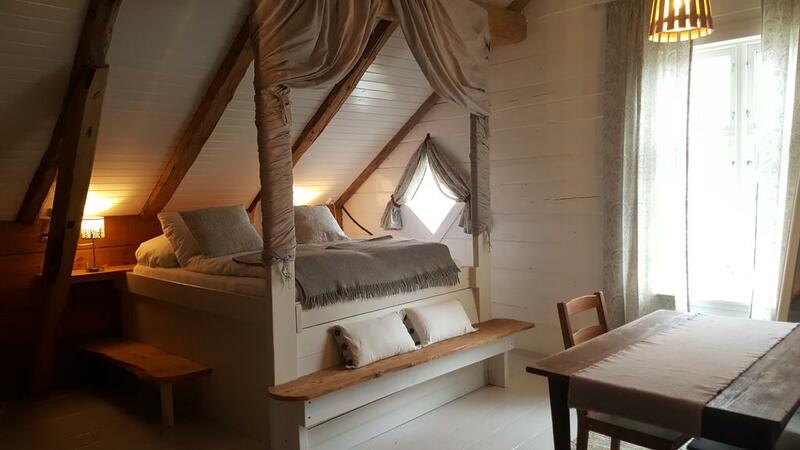 Aurland Apple Farm offers private rooms with shared bathrooms, but their best bargain is the private cottages, if you’re traveling with two or more people. In fact, if you share the cottage with a group of four it will be quite cheap! Aurland Apple Farm is 7 km from the Flåm Railway, so it might be hard to stay here if you don’t have a car (but like I’ve said before, I really recommend renting a car if you want to explore Sognefjord properly). Airbnb also has a lot of great options near Sognefjord, like this apartment in Aurlandsvangen, this one in Aurland, or this one on the north side of the fjord. And if this is your first time using Airbnb you can get a discount by [signing up here]. Are there taxis in Flam that can take you to lodging? What a wonderful site! 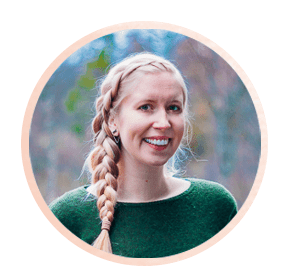 You have anticipated and answered many of my questions about my upcoming first visit to Norway, and then answered questions I did not yet even know enough too ask. Many thanks for your help to fellow wanderers. How does one get from Bergen to Sognefjord? Two senior best friends celebrating 50 years of friendship, traveling by train from Oslo to Bergen in July 2018. 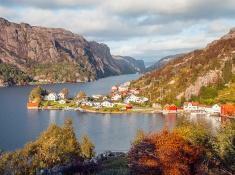 We will find accommodations in Bergen for two days and then maybe in Sognefjord. 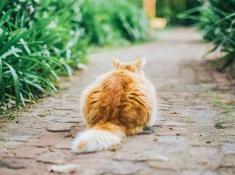 My friend will not do well on hairpin turns so is the bus route a problem? 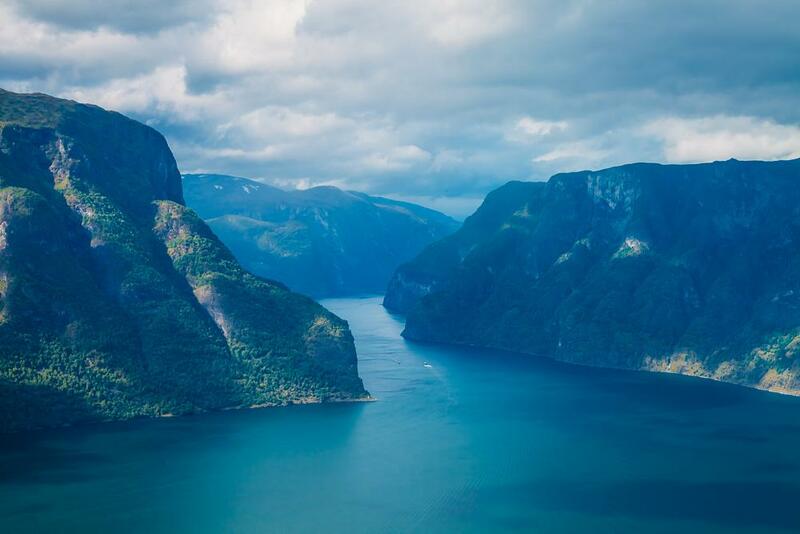 And how do we reserve fjord cruises in Sognefjord? Any particular ones to get? Your blogs are so very, very helpful! Thank you so much. Any suggestions for a family accommodation? We are a family of 5 without a car and are looking to stay in a budget/medium price unit for one or two nights. I’ve never stayed with that many people, but I imagine you could find cabins on booking.com! Such a great article. My daughter and I are coming Norway from South Africa, at the end of September for a whirlwind trip. We fly into Oslo and then plan to take the train/ferry/bus/train to Flam/Bergen.We are planning to stay one night somewhere between Oslo and Bergen e.g Flam or Gundevangen and are looking for suggestions (not too expensive), and also recommendations for accommodation in Bergen, again more on the budget side. 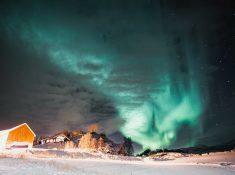 We will be in Bergen for 3 nights before going to Tromso. This is brilliant! I haven’t even clicked on most of the links yet and I’m already in full looking-forward-to-my-trip mode. As I said at your Norway-in-a-Nutshell post: I’m hoarding this for next year’s vacation! Typos (it took me 3 tries to write this word instead of tyops/topys! ironic…): “i’d”, the Walaker hotel has “routes”, and that same paragraph ends without a period. Thanks for the typo alerts!